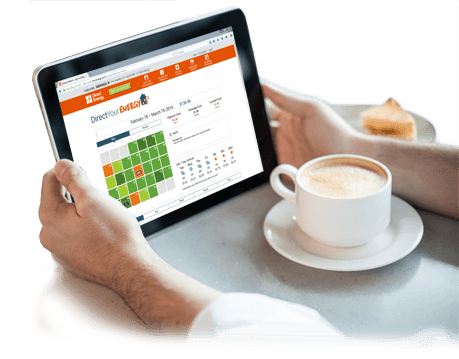 Direct Your Energy is a resource for Direct Energy customers that offers easy-to-navigate tools that depict and analyze their energy usage. Designed to empower customers to make more informed decisions about their energy use, this suite of personalized tools offers unique ways to help customers manage their usage and save money. An itemized bill that displays electricity costs broken out by appliance so that customers can understand the main factors that drive their home's electricity usage. A color-coded bill forecast that estimates whether the customer's next bill will be higher or lower than their last. A dynamic graphical overview of the customer's past twelve bills that can be used to compare their actual usage to their predicted usage, budget and usage last year during the same billing period. This usage graph can help customers make adjustments before their next bill arrives. A budget tool that will help customers stay on track for their next bill. Severe weather alerts so that customers can find out what they need to know at the time it matters the most so that they can better manage their usage. A home comparison tool that compares the customer's home energy usage to homes of similar size, amenities, usage patterns, and other attributes enabling customers to see where they stand against their peers. A home profile that captures information about the customer's home and appliances which is used to feed the algorithms forecasting their bills, itemizing their usage, and personalizing their recommendations. This specialized tool, available to customers in their Online Account Manager (OAM), breaks down energy costs to provide customer insights. Customers can find deeper levels of trust toward Direct Energy because they are empowered with the tools to control their usage and to potentially reduce their energy use and bottom line.